Feelin' fine with the Felt Forum! Dave's Picks Volume 22 presents the last stop on a collector's choice run in the Grateful Dead's home-away-from-home, New York City. 12/7/71 yields a highly pleasurable Pigpen-filled show and what was surely a top-notch Tuesday for all who attended. Talk about vibe-ing with the crowd! At their prime in terms of lineup and performance, the Dead churned out a batch of songs that would soon become well-worn Europe '72 favorites ("Jack Straw," "Brown Eyed Women") and also served up solid versions of freshly-minted classics ("Sugar Mag," "Friend," "Casey Jones"). That winning combination of Pigpen AND Keith? Nothing but peak "signature showstoppers" including what could potentially be the finest "Smokestack Lightning" of all time. The complete show runs a wee bit short (for a Grateful Dead show, that is) so we've rounded out the release with much of the second set from the previous night, December 6, 1971. With exceptional takes on the likes of "Wharf Rat" and "Uncle John's Band" and a massive "The Other One," we're pretty sure you won't mind. 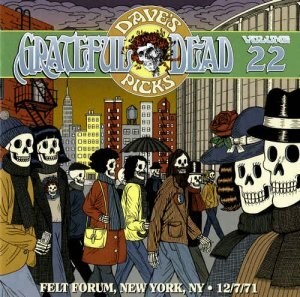 Limited to 16,500 individually numbered copies, Dave's Picks Volume 22: Felt Forum, New York, NY - 12/7/71 has been mastered to HDCD specs by Jeffrey Norman and features illustrations by our 2017 Artist in Residence Dave Van Patten (stay tuned to learn more about the illustrator in an upcoming All In The Family piece).